This scene is one of the most dramatic examples of environmental thuggery in my neighborhood, but it is quite common everywhere, unfortunately. Here's my annual attempt to pass on some common sense. Having the leaves hauled off to the landfill increases taxes, wastes time and money, throws away valuable soil-building organic material and looks terrible. 4. Leaves should never be blown on to the neighbor’s property or into the streets. 1. Leaves should be mowed and mulched into the turf. Using a mulching mower is best but not essential. Turf can take quite a volume of leaves before there is excess. Excess leaves would be when the lawn is about to be completely covered and smothered by the ground-up leaves. 2. At the point of excess, the leaves should still be mulched on the lawn or driveway, but raked, picked up and distributed as mulch in flower beds and vegetables gardens. 4. Never under any circumstances should the leaves be removed from the site. They should either be mulched or composted. All cities should outlaw the city service of picking up leaves and grass clippings. If home and business owners have to recycle the organic matter, then the landscapes are healthier, water runoff is reduced, and less tax money has to be allocated to picking up and managing leaves and other organic matter. Everybody wins! If you have any questions about this newsletter or any other topic, join me this weekend for myLiving Dirt Doctor Radio shows. One of the best kept secrets of the City of Dallas is that the acts of blowing grass clippings or leaves into the street can result in a fine of $2,000, and if one is seen blowing leaves or grass directly into a storm water inlet, a jail sentence is possible. The City spends some $920,000 each years unclogging the underground infrastructure of the stormwater system as a result of debris being allowed to enter the storm water system. We are aware of what happens to our shower or sink when there is build up in the drain, this is what your city spends almost a million dollars per year unclogging. This money would be better spent if it were available for summer reading programs at the library. Wow! Great information, I'm sending it on to my city council member. Many thanks! I agree. In the meantime, they are pure gold for me as I go pick them up and bring them home for the garden and the long term compost pile (I have 2 piles, a smaller one I can manage to turn and a bigger one where the shrub trimmings go ..they eventually break down too). Howard, Thanks for the info on leaf mulching. That’s exactly how we’ve been doing it since the park district started in 1912. This is just wrong - you live in TX, if we did this with leaves (KY and east or any area with way more trees than you have in TX) the bacteria to fungus ratios get out of wack the soil compacts cause the mag to cal ratios get mixed up = compaction and thin grass sets in - plus driveing over and over it in the late fall - early winter further compacts the soil. I have 25 years of experience and tried it everyway. You can certainly use a mulch mower (we use Wright 52 inch - with mulch blades) and no problems but we could easily mulch in the heavy leaf drop where the grass still looks great but over the winter the decomposing grass robs the grass roots of nutrients and the next spring the healthy fall yard recovers much slower, is thinner and is for sure not as draught tolerant in the summer. We also have more brown patch. This in my professional opinion is good advice - except for the heavy drop (advice) - especially with the trees we have here in the east - get them off the grass and into beds or a compost pile. but many yards of 3 or 4K or smaller even this is impractical many municipal counties pick it up and compost it and then sell it. This is also a good practice. Howard, I find many useful ideas in your newsletter, but do have one point of info regarding leaf management. We stop mowing our grass during the cool season when most of the oak trees on our property shed their leaves, so turf mulching as you describe isn't really do-able. Great piles of the leaves blow into our several gardens and are left there until spring. Then I rake them out to clean up the beds and add new plants and re-mulch with pine bark mulch. Big old dried oak leaves look like brown paper to me, and even modest layers shade out any volunteer plants trying to emerge. Yes, they shade out the weeds too but it's a trade-off as usual in the garden. 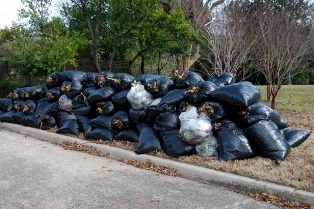 We don't bag or burn leaves but we do try to find places to pile them up where they can compost themselves over time--usually in shady spots where they don't detract from what we imagine to be a relatively neat landscape. Keep up the good work!